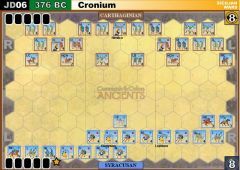 Carthaginians do like their ranged combat especially when luck is on their side (the number of hits was far above the average). John tried attacking on the flanks but was quite unlucky with his rolls. 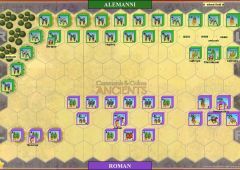 The initial ranged attacks between approaching armies costed the Epirotes one unit. My initial attack with heavy infantry on the right flank was afflicted by very poor dice roll and the counter attack by Togan gave him two more points. On 0-3 I played Cavalry Charge throwing my elephants and my heavy cavalry, luckily still alive, into the fray. The tactic worked and I scored five points in a single round. Togan responded by double-timing his best infantry on my left flank, taking another medal. 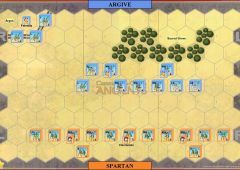 But thanks to a lucky "I'm Spartacus" dice roll I managed to collect the last two medals eliminating cornered Carthaginian units. A slow beginning with a strong crescendo, in the best CCA tradition. Last edit: 1 year 5 months ago by g1ul10. 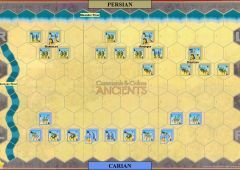 Whole game was decided on my right (cavalry, elephants) side. After some initial, slow movements, all action turned there - it started with Chris attack on my LI, which cannot evade. Then my cavalry strikes back, only to receive Mounted Charge which I in turn counter attacks. Very intense, bloody and fast. After that left wing of Chris ceased to exist and it was only picking the points to finish a game - which costed Epirote two banners but led to succesfull finish. Elephants rocks, especially when you use them on unprepared Romans! Good battle with the barbarian chariots being the deciding factor - they came on early but couldn't quite do the damage intended. 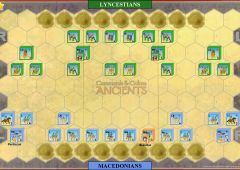 Macedonians gathered in the center and hoped to chip away into the end and ended up doing just that. I'll be available tomorrow (Sunday 19 Nov 2017) almost all day. 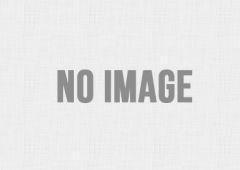 Let me know your availability using this forum so we can meet online to complete our games. I can play at 3pm local time. Or also a bit later if you prefer. Will wait for you online. 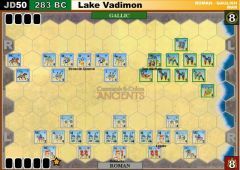 An interesting game in which ranged fire played a major role. 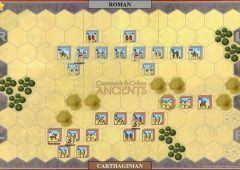 A cavalry charge by Epirote elephants proved effective, but the Carthaginian counter-charge eliminated the Epirote heavy infantry with a single blow. The larger hand allowed me to out-maneuver Alessandro on the flanks and at the end he had to abandon the relative safety of the hill and attack my line. The reaction by the Epirote heavy infantry ended the game. 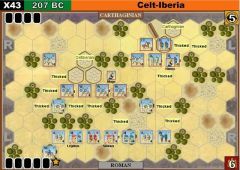 I think this scenario is unbalanced in favor of the Epirote, but with the right cards and good dice rolls, the Carthaginian has the units to win the game. 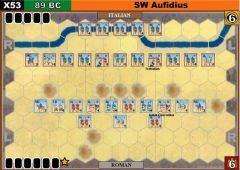 Alessandro maneuvered smartly, but I was pretty lucky with the cards myself and able to strike each time I spotted a weakness in the Carthaginian line. 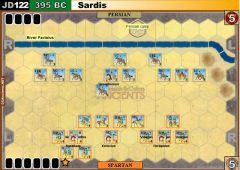 Round 6 - JD24 Mount Eryx (277 BC) has gone 3 times to Carthage (7-5, 7-5, 7-6) & 3 times to Epirus (7-3, 7-4, 7-2) in the tournament, but the Epirote score when losing has been higher. I played this twice against Railrodder, and Epirus won both times, but he had a very defensive strategy of pulling back onto the Hills, and away from the Epirote Heavy infantry. Didn't work, but combined with a good offensive play, it might be a good delay tactic. I think this scenario has a fair bit of replayability. "I will either find a way, or make one." The game was much more tense and balanced then initial set-up and cards disparity shows. It started with standard attack in the center (I had to use double time - no any other card for center). 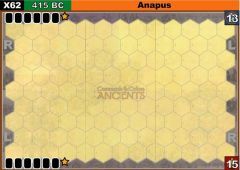 Then Giulio counterattacked and it was 3-1 for Greeks. Some moves (cavalry and light troops) on my right were visible but inconclusive (til the end of the game there). From that moment game continued in a way banner-for-banner, with some crazy rolls (so many flags), unsuccessful MC (me) or very nasty FS (also me). In the end it concluded 6-4, with score disparity as it was set after initial round. Thanks to Giulio for playing on short notice!